Fresh, aromatic and seasonal vegetarian and vegan food, lovingly prepared. We are Heather and Mel and we started cooking together in 2011 when we started a Supper Club. We are both united in our passion for good food and our love of Indian flavours and spices. We established Gopal’s Curry Shack 2 years later - our first gig being the wonderful Indietracks Festival. Since then we've built a loyal following at local food markets and events, turning what started as part-time fun into a full-time job (and yes, it’s still fun). Gopal’s Curry Shack 'pop up' at food festivals, markets, events and takeover kitchens all over the South West and beyond. We can cater for a range of occasions including weddings, parties, corporate events, location catering and celebrations. 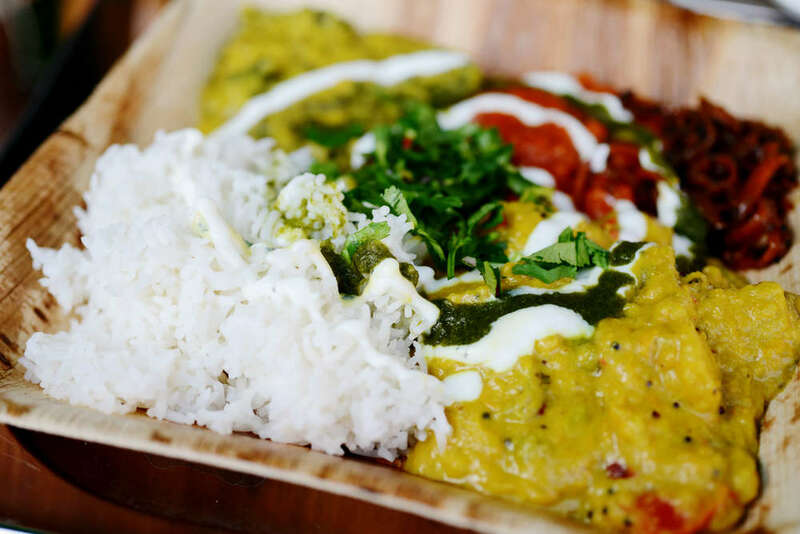 We make creative, vibrant dishes using local, seasonal produce and combine it with the flavours and spices of India. All of our dishes are vegetarian, most are vegan and the majority are gluten free. Smashed up samosas smothered in a rich tomato and chick pea curry then topped with date & tamarind chutney, mint & coriander chutney, crunchy sev, yogurt sauces a pomegranate garnish then sprinkled with chaat masala powder. A medium-spiced curry tempered with mustard seeds, fresh curry leaves and turmeric. We vary the vegetables to reflect the seasons but you will likely find sweet potato, green beans or red peppers all cooked in a creamy coconut milk gravy. These shredded vegetable snacks are made from a chick pea flour and flavoured with garam masala. Flavours throughout the year include sweet potato and spinach, parsnip and ginger, red pepper and sweetcorn or carrot, cumin and coriander. Heather has had over 20 years experience working in the music industry including running her own record labels, promoting gigs and running her own club night. Favourite Gopal's dish: anything with Paneer. Best Gopal's moment: getting to drive a Golf buggy at an event we did and getting to drive the vintage steam roller at Indietracks festival. Being named by waitrose weekend magazine as one of the top 5 street food vendors in the UK. Worst Gopal's moment: the numerous times that a bin bag full of food waste has split on my feet at the end of a very long day. The best thing about running Gopal's Curry Shack: food Swaps with fellow street food traders, we get to eat some really tasty food! Also working for ourselves, the fact that everything we have achieved is down to us. And of course, driving unusual vehicles! Best Gopal's moment: Getting our Onion bhaji scotch eggs championed on BBC 6 music during the 6 music festival. Mark Radcliffe described them as one of the best things he's eaten whilst introducing Julian Cope on stage, this was a very proud moment for me. Worst Gopal's moment: an argument leading to a physical punch up with Heather at 5am at Indietracks festival. We had to stop fighting when we realised that we were locked out of the festival, this meant an hour of wandering the perimeter trying to find a way in. I finally managed to find us a way back in whilst Heather tried to tame a horse! The best thing about running Gopal's Curry Shack: being able to be creative and try new dishes and flavour combinations. The amazing support and feedback we get from our customers.